Lamborghini Huracan Performance, Engine, Ride, Handling | What Car? The Huracán is a fully fledged supercar and feels it whether you go for a rear-wheel-drive or four-wheel-drive version. The high-revving V10 dominates the car, pulling with real gusto from low revs and very little inertia as it rips towards the 8500rpm redline. Sure, you don’t get quite the explosive (if more short-lived) hammer blow of acceleration of turbocharged rivals such as the McLaren 720S, but the more progressive, elastic delivery of the Lambo's V10 is even more intoxicating. The Huracán is quiet enough not to drive you mad when you’re on a steady throttle, but let it rev – particularly if you’ve switched the variable drive modes to the fully rampant Corsa – and it becomes a raging, popping and crackling symphony of exhaust noise. Any supercar fan is going to revel in that thrilling, addictive soundtrack. The seven-speed dual-clutch gearbox is also meticulously well sorted, shifting smoothly and with quick-fire precision just when you want it to, even if it can lurch a bit when engaging a gear at very low speeds. For fast driving, you’ll get more satisfaction from using the steering wheel-mounted paddles to change gear manually. All Lamborghini Huracáns feature the delightfully named ‘Anima’ switch, which allows you to toggle through drive modes and vary throttle, exhaust noise, gearbox ferocity, steering weight, traction control and – if you’ve added them – the optional variable dampers. Even in the most relaxed Strada mode, the Huracán feels appropriately sharp, but most owners will favour mid-level Sport, when everything steps up a notch and makes the Huracán feel properly incisive. The problem is that the Huracán – in every form – always feels like it's trying to keep you safe rather than give you the no-holds-barred supercar experience you get from a Ferrari 488 GTB or McLaren 720S. Those rivals are more playful and engaging, and ultimately more rewarding on a twisting road. The Huracán's standard steering is preferable to the optional variable set-up, but still doesn't stream as much feedback to your fingertips as we think a supercar should. 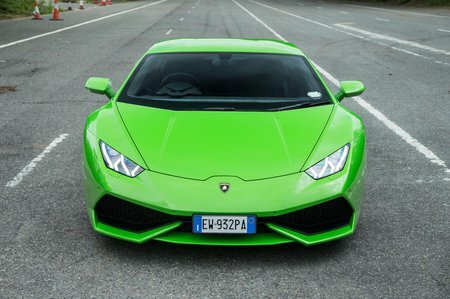 Still, this is all deliberate on Lamborghini’s part, since the Huracán is typically bought by people who favour easily accessible performance rather than fearsomely edgy handling.